Omen of Sorrow is getting a second limited-time demo on the PlayStation Network in both North America and Europe. Published by SOEDESCO and developed by AOne Games, this horror inspired fighting game will launch digitally on November 6, 2018, with a European physical version launching that same day. Unfortunately, “due to an unexpected and significant increase in the factory lead time for local production” the physical version in North America has been delayed to November 20, 2018. The Executive Producer and Co-Founder of AOne Games said, this second playable demo is meant to give players a better trial version of Omen of Sorrow “since the last public demo and event releases.” In the first demo, you could play as Zafkiel, Gabriel, and Caleb. This time around, Caleb is being swapped out for Adam. Just like the last demo, this one is playable in both single-player and local multiplayer. Below are the official game details and a new set of screenshots. 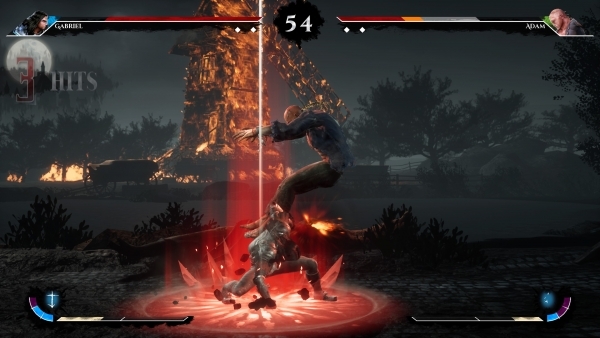 Omen of Sorrow is a four-button fighting game inspired by classical horror, fantasy and iconic myths and legends. Players can find themselves battling in various dangerous and gloomy places, such as a raging forest fire or a sinister castle. Omen of Sorrow also features 12 legendary characters, such as the half-angel Gabriel and the strong but unlucky hunchback Quasimodo. All characters are connected by an intricate storyline full of internal struggles, spite and malice. Battle with many iconic characters and strategize with character specific special moves and abilities! Flirt with danger in dismal stages, inspired by age-old European legends! Take part in a gripping tale of darkness and despair in an exclusive Story Mode! Endure grueling battles in Arcade and Survival Modes, or beat up friends in local Versus! Experience a complete Online Mode, featuring Ranked and Casual matches, and create lobbies for custom rule matches! Unlock more than 200 in-game rewards by conquering all of the different gameplay modes! Master your fighting skills in a fully featured Training Room!